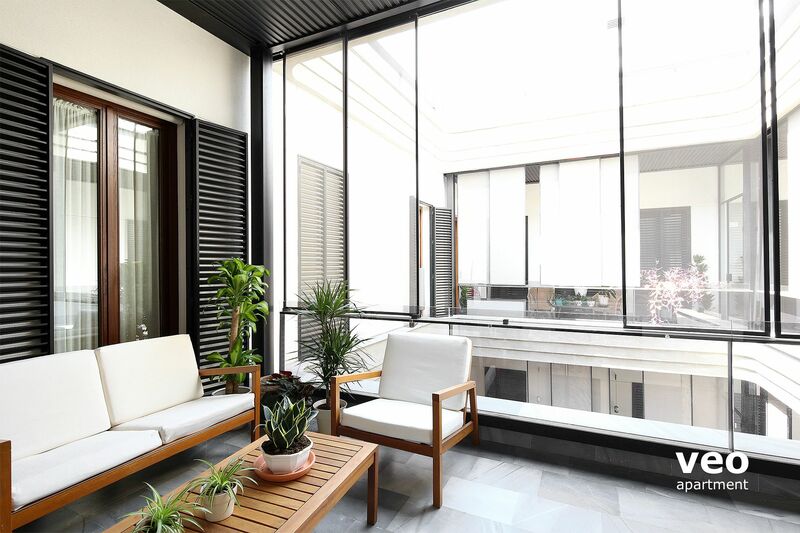 Apartment with modern design interiors and a large, lovely private terrace. With 2 bedrooms and 2 bathrooms for up to 4 guests. 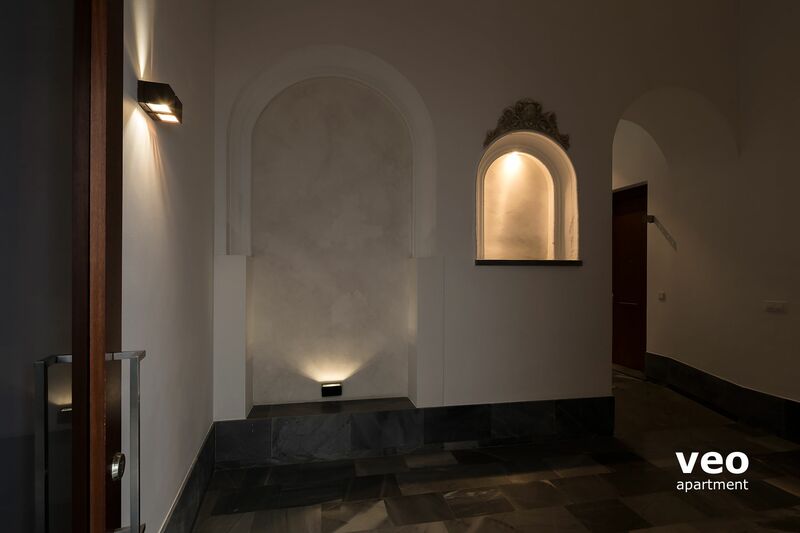 Located within Seville's historic centre, close to the famous Alfalfa square, at just 10 minutes walk from the Cathedral. 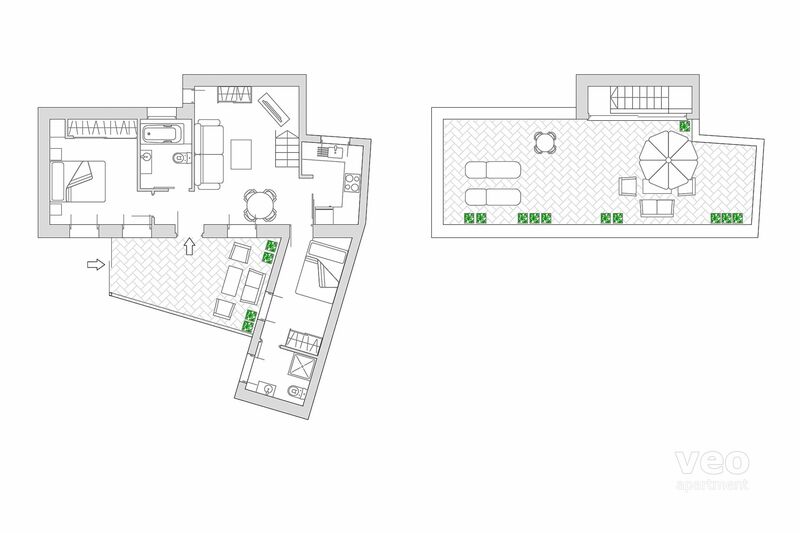 On the lower level is the living room furnished with a sofa, armchair, central table and TV. Dining table with chairs. 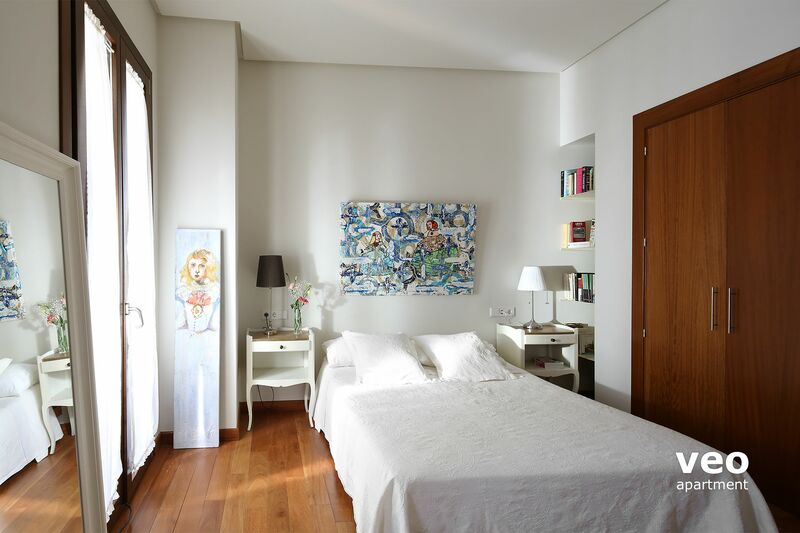 Central air-conditioning (hot/cold), free Wi-Fi internet access, wooden flooring and original artwork. Next to the living room, separated by sliding glass doors, is the kitchen - fully equipped for self-catering. Appliances include dishwasher and washing-machine. 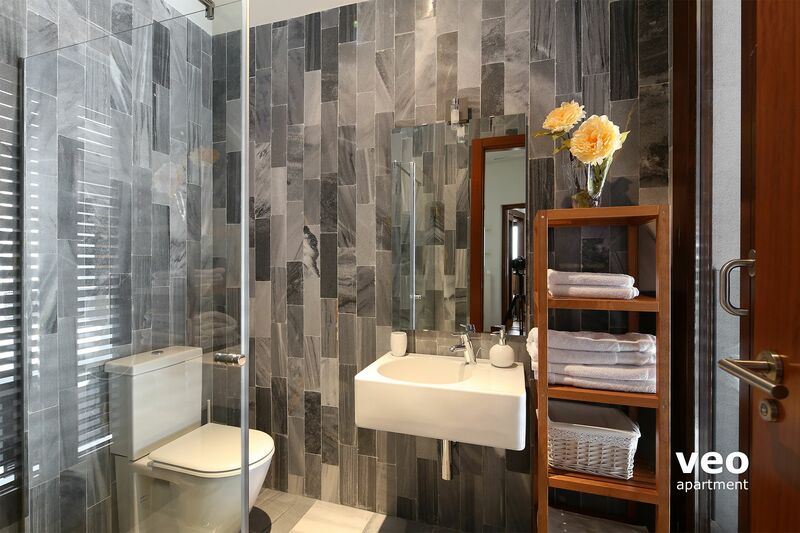 A corridor leads to a superior, marble-lined bathroom with bathtub. 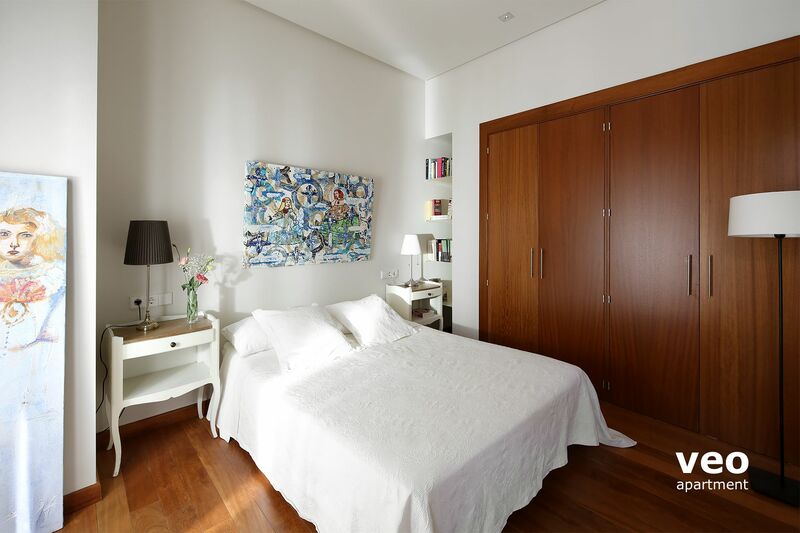 Beyond is the master bedroom with a double bed (150 x 190 cm) and a large built-in wardrobe. The second bedroom, smaller in size, has a double bed (135 x 190 cm), built-in wardrobe and en-suite bathroom with shower. 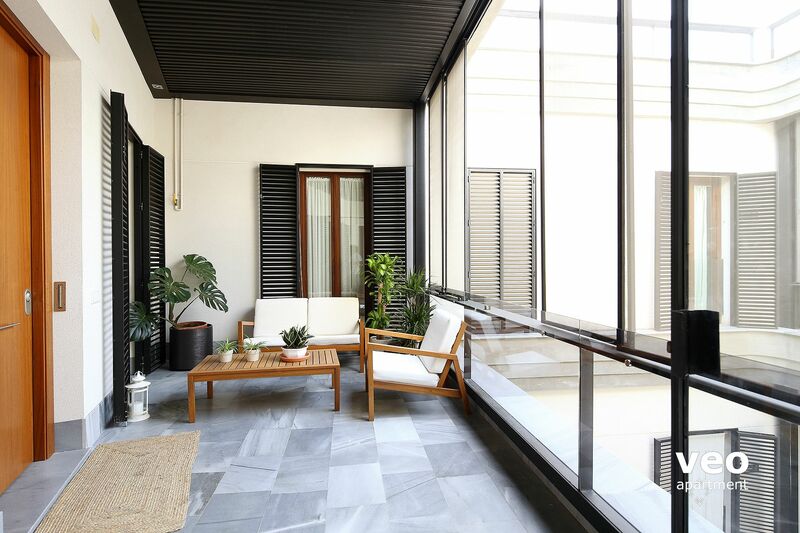 From the living room, stairs lead to the upper level with a sunny private terrace and exceptional rooftop views, including the Giralda and Cathedral. The terrace has 40 sqm and is furnished with outdoor seating, deck chairs and table. It is partially shaded by a parasol making it an ideal spot to relax and enjoy the Sevillian sunshine. 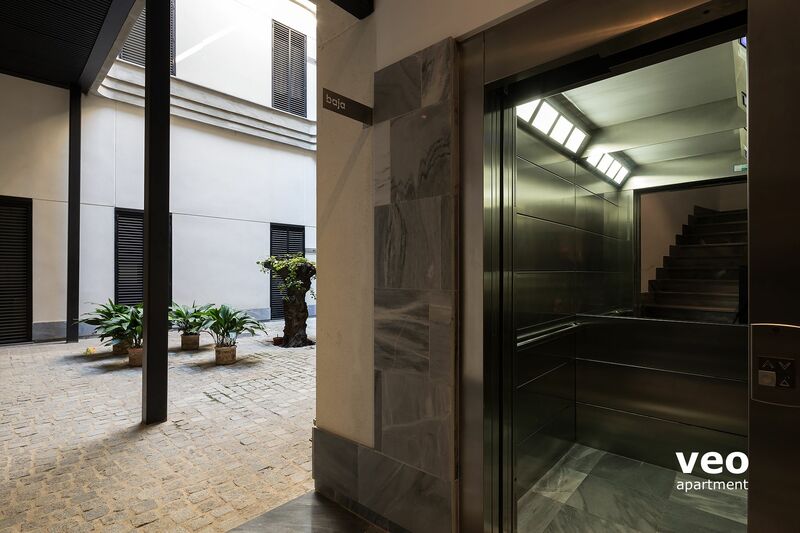 This apartment is on the second floor of a contemporary residential building built in 2008, with an elevator. 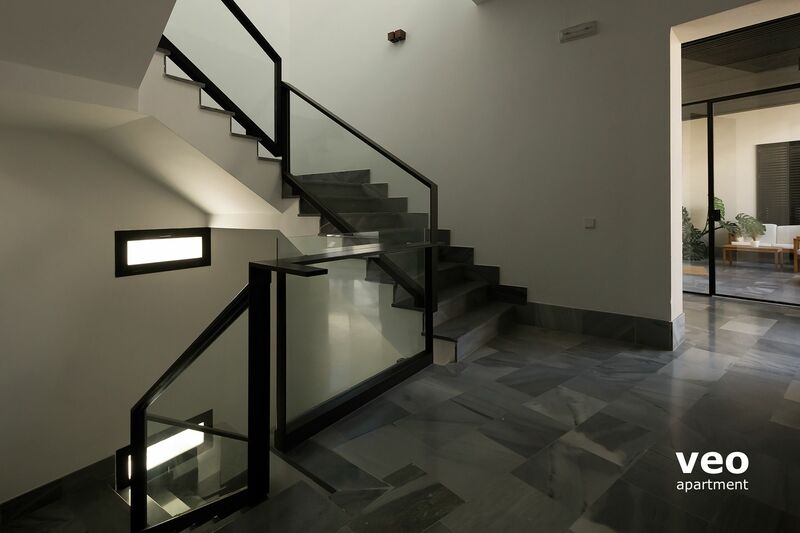 The apartment is well located in the Santa Cruz barrio and it is easy to access all main attractions of Sevilla. Everything did go well from the beginning to the end of our stay. "Lovely apartment in a very central location"
Lovely apartment, well presented, clean and tidy, very centrally located. Just as advertised, with the bonus of a great roof terrace for lazy afternoons...and evening drinks. Highly recommended. "Sich zu Hause fühlen in Sevilla"
Super Apartment, es hat alles, damit man sich wohl fühlt. Lebensmittelgeschäfte gleich um die Ecke und trotzdem sehr zentral! "An oasis in the centre of a cultural paradise." The apartment was clean and well supplied. The strawberries and oranges and bottle of sherry was a lovely welcoming gift! Lola provided a wonderful orientation. 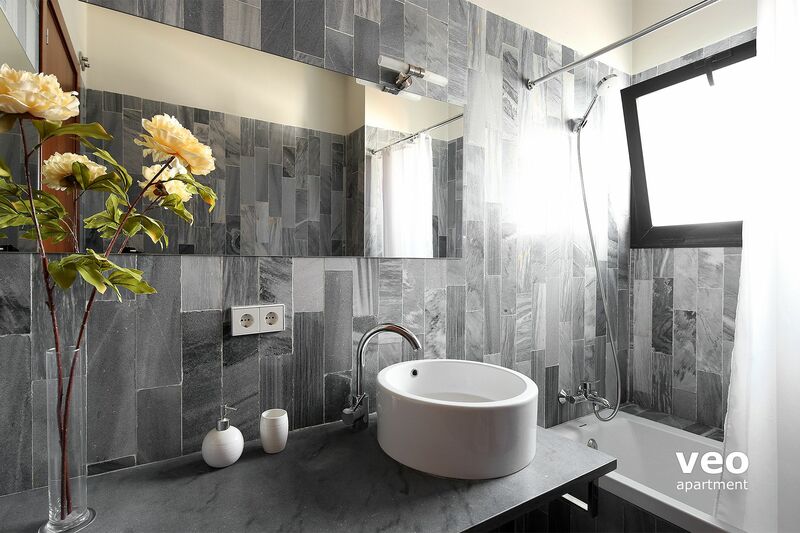 The only thing I would suggest is the following fir the shower in the second bedroom: the floor of the shower is very very slippery when wet, therefore either a grab bar be installed or a non slip rubber mat be provided. As a senior I was very concerned about falling and breaking a bone or two! The apartment was an excellent choice for us, plenty of hot water, close to all stores, grocery, and cultural areas, excellent security, an elevator, and the air conditioning was wonderful! Thank you! "Great apartment to stay !" "Lovely Apartment in the City"
We enjoyed our stay at Corral Rey Terrace 5 so much! 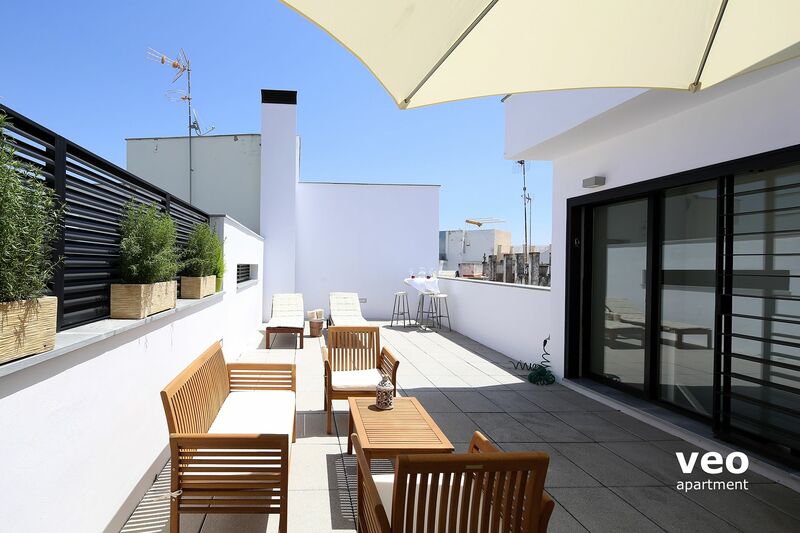 The apartment is lovely - very clean, comfortable, well-decorated, centrally located, and with a terrific rooftop terrace. The location was perfect. It was a quiet street but very close to everything we wanted to see. We walked everywhere; even the walk to the river was an easy one. And we found many great restaurants within steps from the apartment. Lola was wonderful! She was so nice and helpful to us in getting us settled and oriented. I only wish I had had more time there. 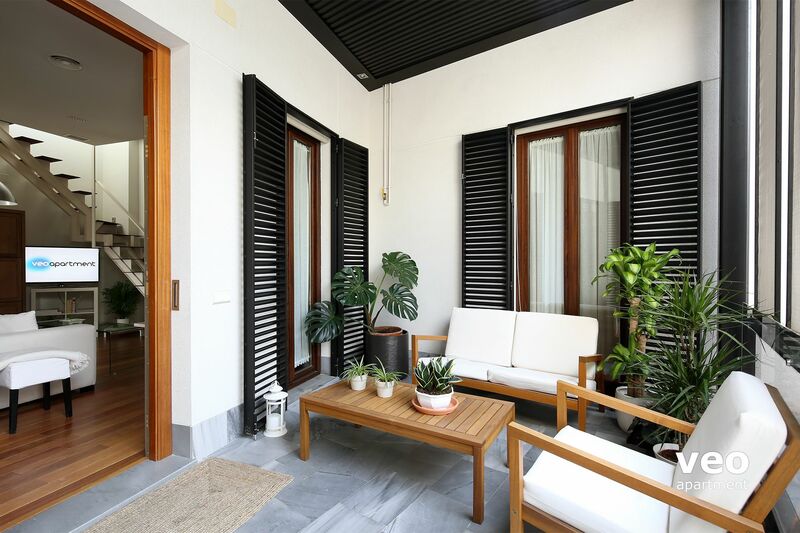 "Fabulous apartment in the heart of Seville yet quiet "
This apartment has everything you need for a wonderful stay.It is well situated for all the major tourist sites and you have a great view of the Giralda from the terrace. The beds are very comfortable and the apartment is very quiet and secure.The terrace is a perfect space to enjoy the sunshine,relax, eat and drink - in fact its what makes the flat special.We were warmly welcomed and the team were responsive to any queries. Highly recommend this flat and Veo apartments. I we will certainly be booking with them again. "Great apartment, very central, short walk to Cathedral and other must see sites." 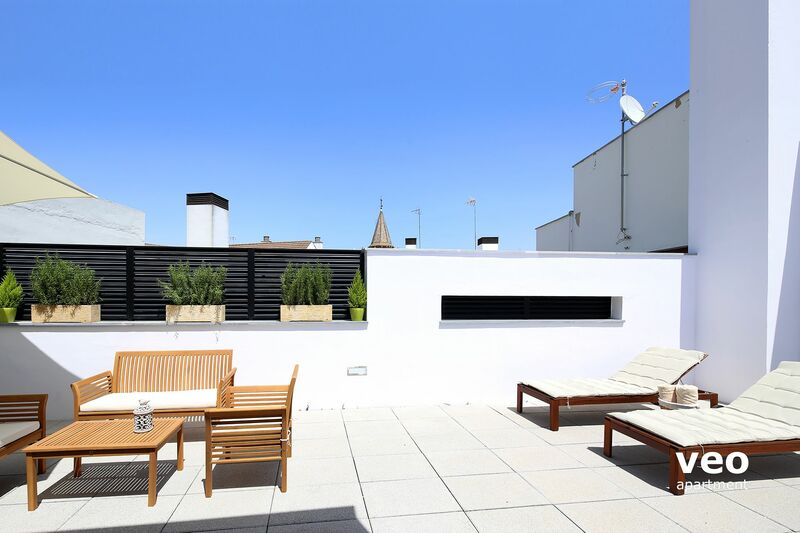 Perfect location, modern apartment with an excellent roof terrace. Two bedrooms, two bathrooms and fully equipped kitchen. Enough room for four people. Everything was as it should be, the help with booking parking was appreciated, we were met when we should have been and the explanation and tour of the apartment was good. "A beautiful apartment in a wonderful city"
Excellent apartment in a great location. Furnished and decorated to a high standard - couldn't find fault with anything. Roof terrace an added bonus. 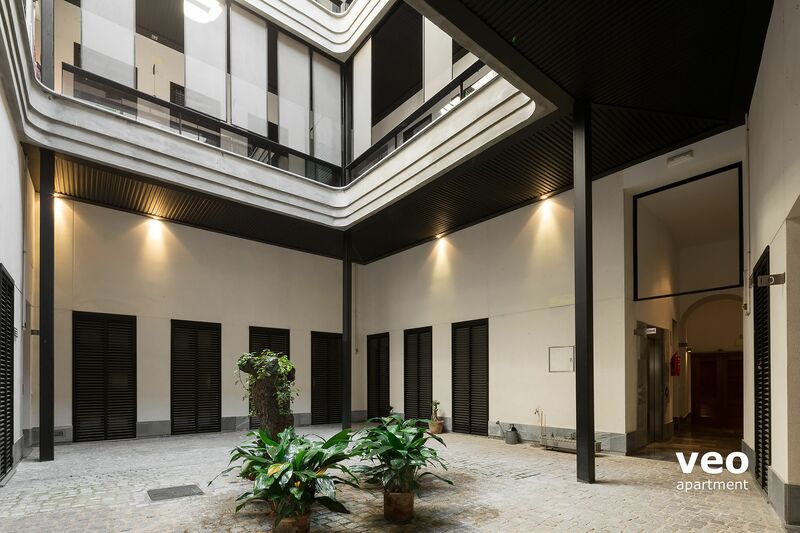 "Clean, modern apartment in the heart of Seville"
The apartments are located in the winding streets of the historical centre of Seville. They are a short walk from the Cathedral and Plaza San Francisco. 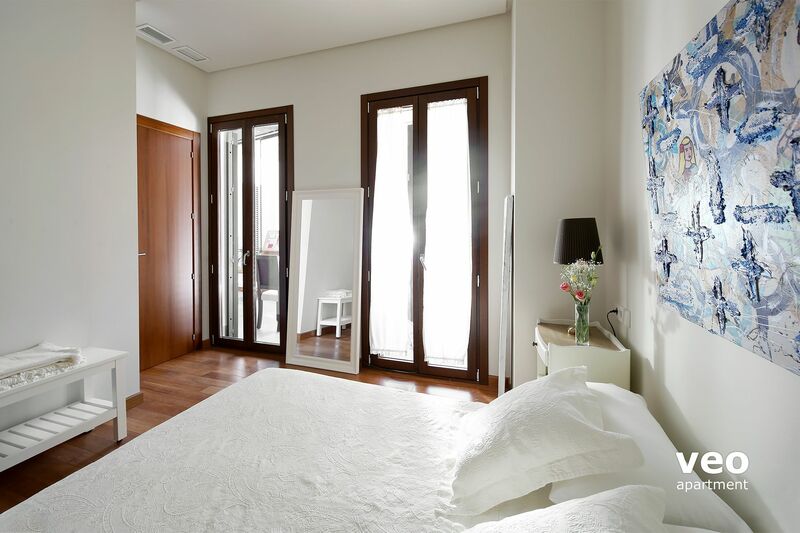 They are modern and contemporary apartments, providing a great base from which to explore the delights of Seville. 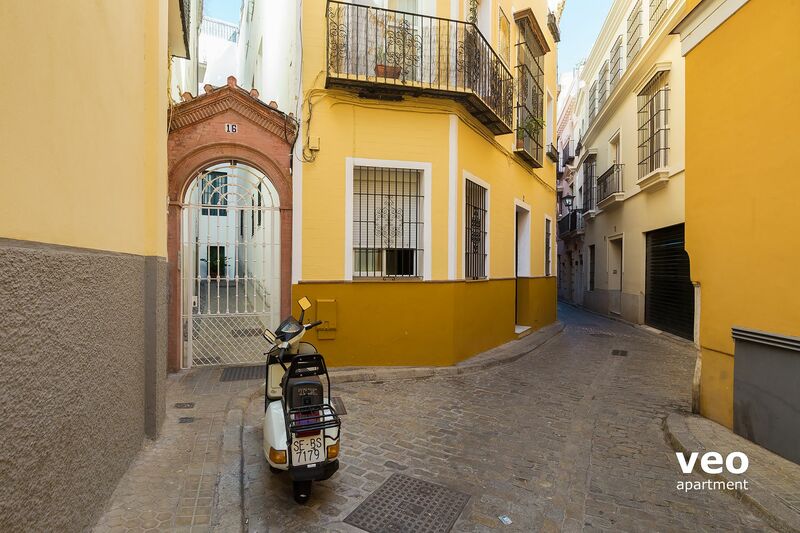 "Beautiful apartment right in the city centre"
This apartment is so perfect and is situated right in the centre of Seville. We were immediately welcomed at the gates and felt very settled in. The apartment was easy to find and because of its location in Alfalfa, bars and restaurants are just a short 2 minute walk away, the apartment is on a quiet back street meaning that you get to be in the heart of it all without the noise in the evenings. 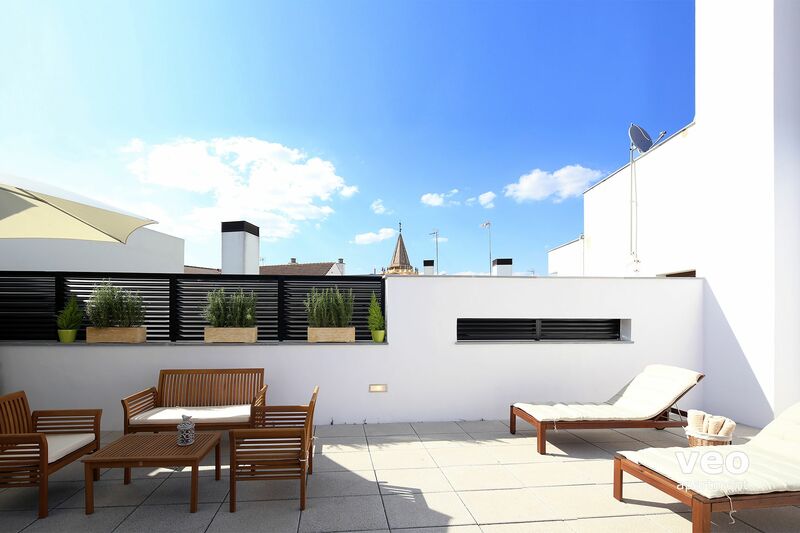 The apartment is stunning, minimalistic but so beautiful and has everything one could possibly need and a view on the rooftop terrace to die for. I will definitely look to stay in this apartment when I am next back in Sevilla. Thank you so much for providing us with such a great place to stay. 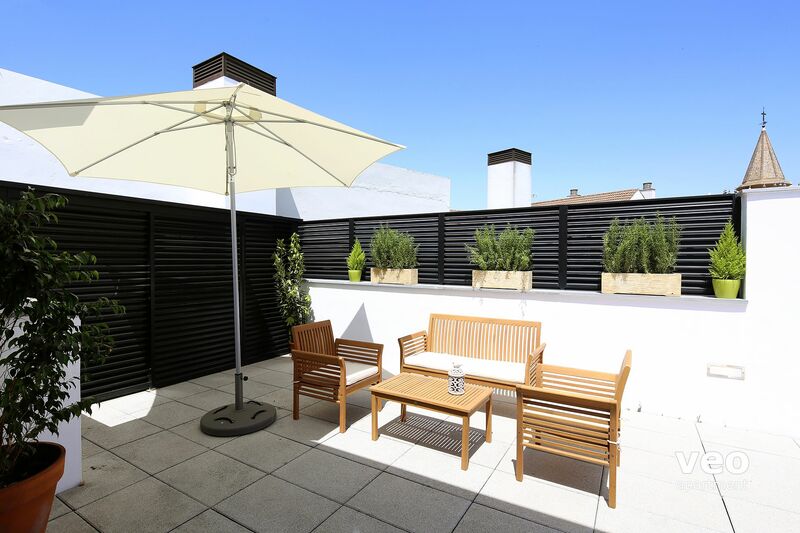 "A fantastic apartment in a great location"
Corral Rey terrace was everything we had hoped for. We were met by Rosa who was really helpful. 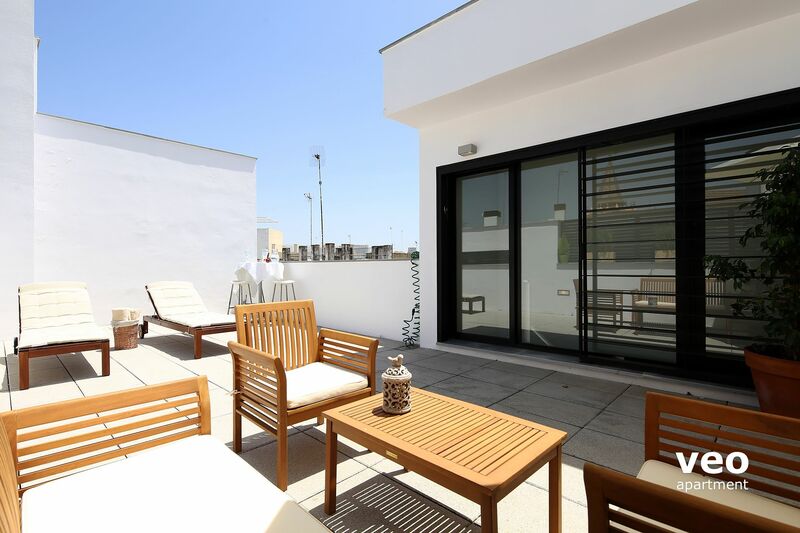 The apartment is spotlessly clean, really well equipped and has a fantastic roof terrace. This was our first time in Seville and the location could not be better for exploring this amazing city. There are loads of great tapas bars as well as a well stocked little supermarket just yards away. We could not fault anything about our stay. 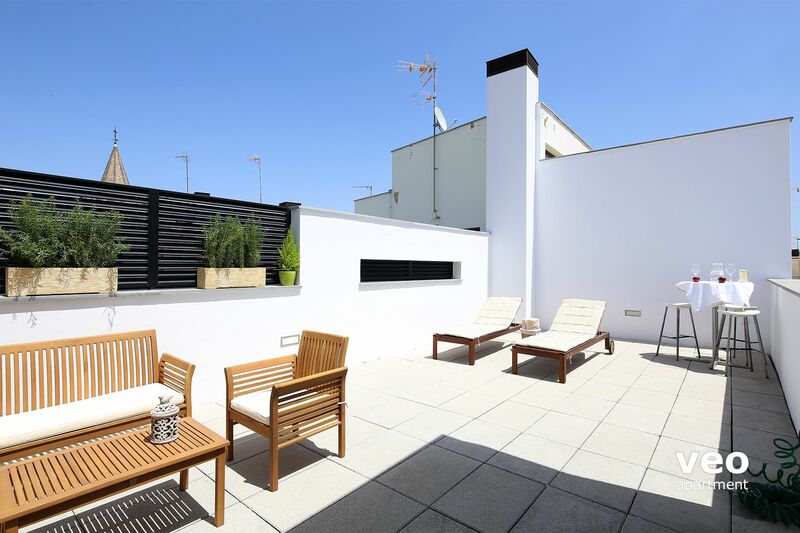 "A very good apartment, excellent roof terrace ideally positioned in the Centro District." Stayed at this apartment for three nights in July 2016.Was met by apartment manager Lola Rodriguez who was extremely helpful. The apartment is fully equipped and was ideal accommodation for our trip. 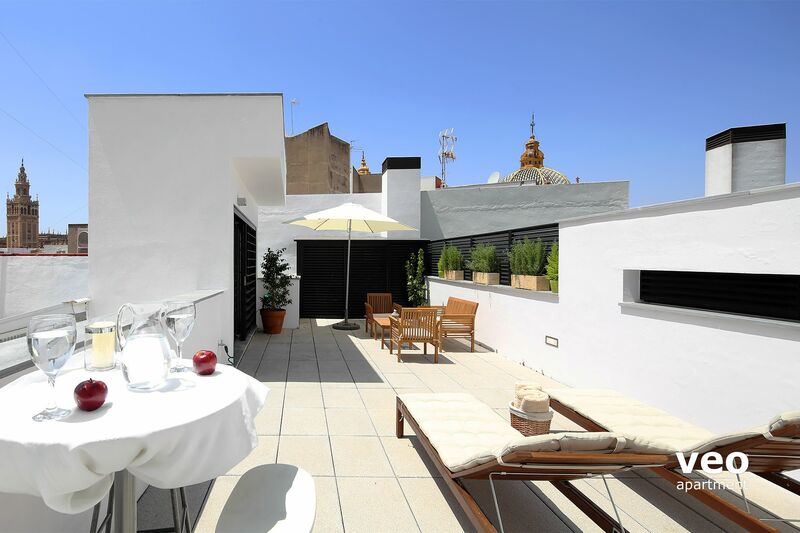 I would recommend this apartment for either short or longer stay.The roof top terrace is excellent. I have rented via Veoapartments on numerous occasions and have always found the standard of accommodation and service to be excellent. I would highly recommend this apartment. It is modern and stylish, as well as being comfortable. It is clean and has great facilities. The roof terrace is such a bonus. 2 minute walk from the cathedral and alcazar. Superb value for money. Superbe appartement moderne avec tout le confort et en prime une terrasse avec une vue imprenable. Appartement parfaitement situé pour explorer la superbe Séville. Merci à Veoapartment pour leur accueil chaleureux et hyper professionnel. "Très confortable , terrasse géniale, situation idéale ." "Great location/clean and neat/professional management with great communication." Had a great time and the apartment definitely fit our needs. An accommodating manager (needed to print boarding pass for flight & requested a late check out). We were so appreciative. "A wonderful apartment in a wonderful city!" 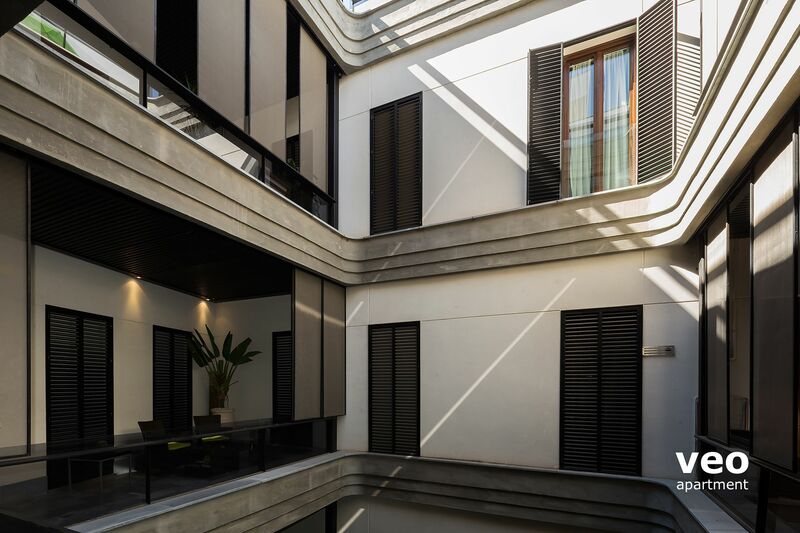 Corral Rey Terrace 5 was the perfect apartment to use as a base to explore the wonderful city of Seville! 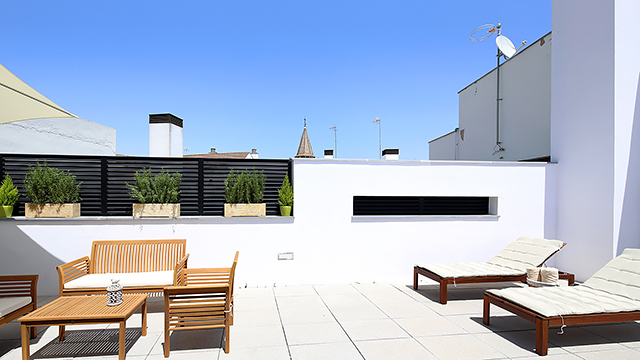 The apartment was clean, comfortable and well equipped with fabulous rooftop terrace to enjoy the November sunshine and the views of the rooftops and Cathedral. Lola, the manager, couldn't have been more helpful and we will be returning for a second visit! 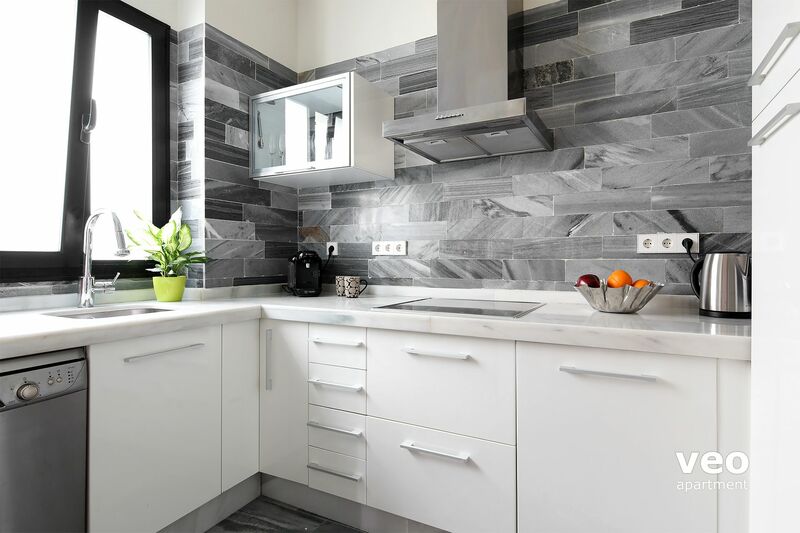 A large, modern and tastefully decorated apartment. Two bedrooms/baths, large sitting room and well-equipped kitched (all even nicer than in the photos). But the icing on the cake is the gigantic rooftop terrace or, if the weather is too hot or too cold to be outside, the glassed-in terrace overlooking the courtyard. Perfectly situated - less than two minutes walk to Alfalfa. Aside from the apartment itself, we were overwhelmed by the service. We (very stupidly) locked ourselves out (and our tickets, money, passports etc all inside) - in the late evening the day before our (very early) morning flight - we were in total despair. Half an hour later the door was opened and when we wanted to pay for all the trouble we had caused, were told 'of course not. It's just normal - a part of our service' We stayed in three different Veo Apartments during a months holiday in Andalusia - two in Seville, but also in Grenada. All were good, but this was our favourite of the three. Appartement très bien, chose tout de même à savoir, il n'y a pas de fenêtre donnant sur l'extérieur. Toutes les fenêtres ouvrent sur la cour intérieure, avantage, en été cela réduit la chaleur, par contre, ce n'est pas très lumineux. Le Corral Rey Terrasse 5 avait 2 terrasses, une intérieure devant l'entrée de l'appartement et l'autre sur le toît. Nous avons bien profité de celle sur le toît, très bien exposée, grande, avec une table basse, une table bistrot, 2 chaises longues. Nous avons apprécié de pouvoir en profiter fin septembre, température idéale. Il y a des commerces à proximité, tout est relativement proche puisque l'appartement se situe dans la vieille ville. Très bonne adresse au calme, aucun bruit de la rue. "Great apartment in heart of Seville"
Wonderful apartment. Very comfortable, clean and near to all the sites. Lovely terrace for relaxing and having a drink. 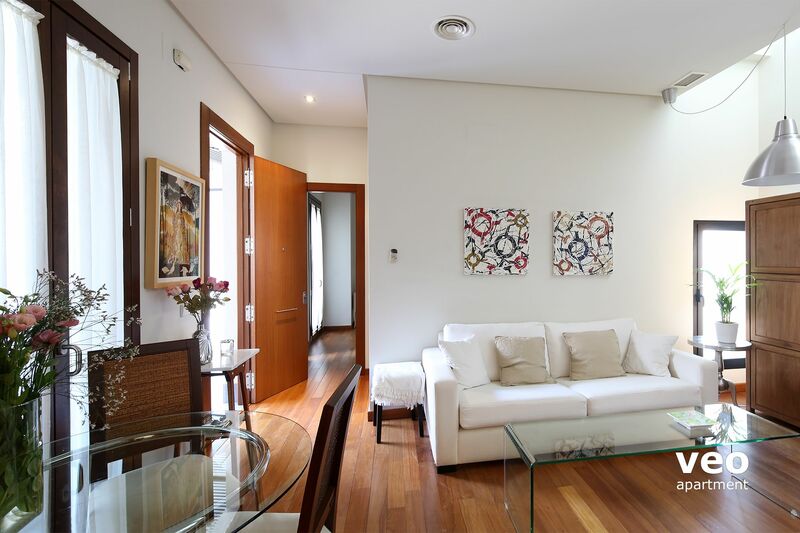 "Very nice modern apartment in the center of Seville"
We had a great time at the Corral del Rey apartment. 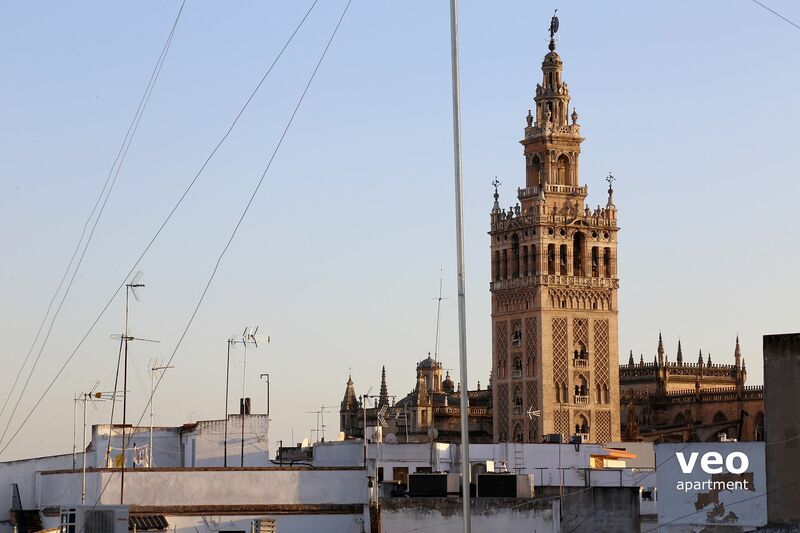 The terrace is gorgeous with nice views of the Giralda and other Seville churches. The apartment is well equipped with everything you may need for a short stay. It seems recently remodeled and is very clean. We got this apartment because the one we booked was suddenly unavailable Veoapartment took care to suggest this one as an alternative because it was close to the apartment our friends had rented. The terrace is the most brilliant part of the house - we spent a couple of mealtimes there and enjoyed the space. The house is decorated in a contemporary style with lots of graceful touches and a profusion of serene white and warm wood. The beds and the furniture were very comfortable and perfect for lazing on holiday. 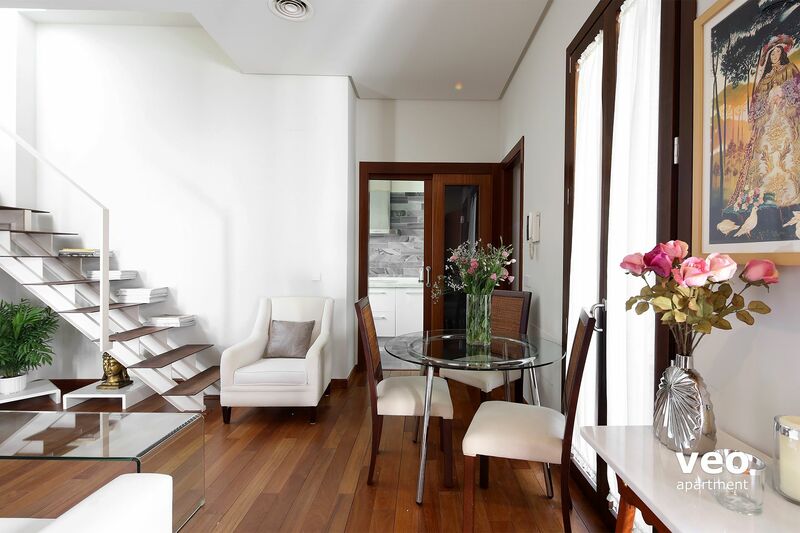 Locationally, the apartment is close to many bars, restaurants and shopping areas. The apartment manager was very helpful with the instructions and suggestions. 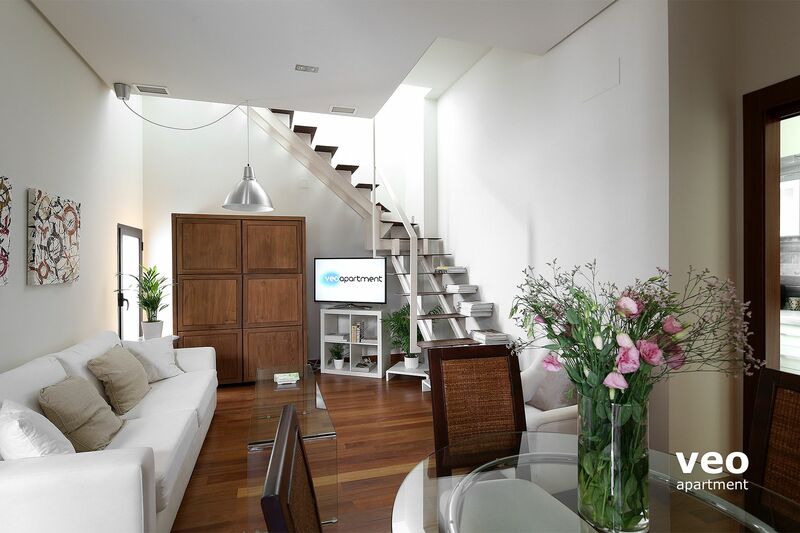 "Peace and tranquility in the heart of Seville"
A beautiful apartment in a great location. A wonderful private terrace and very efficient air conditioning (it was in the mid 30s Celsius the whole week!). Would definitely stay there again.